Any video converter can convert any audio or video multimedia file into destination format with having advanced effects, pre-made profiles for several devices and settings. We can say its all in one multimedia converter that support almost every audio and video file. AVC has the ability to get input of any multimedia file and produce as output in user selected file extension. Normally, it will never lose original quality of video but video bit rate and quality will definitely hearts it. The super amazing speed is enough to beat Format Factory and Total video Converter programs. The best thing it can do, is never slowing down overall performance of PC. The simple and user friendly graphics makes it lovable for everyone. Faster conversion without losing quality of video is outclass of any video converter which makes it leading multimedia converter in worldwide. Any video converter allows conversion between various formats allowing: MP4, AVI, MPEG, MKV, VOB, DVD, RM, WMV, 3GP, FLV and RMVB as well. 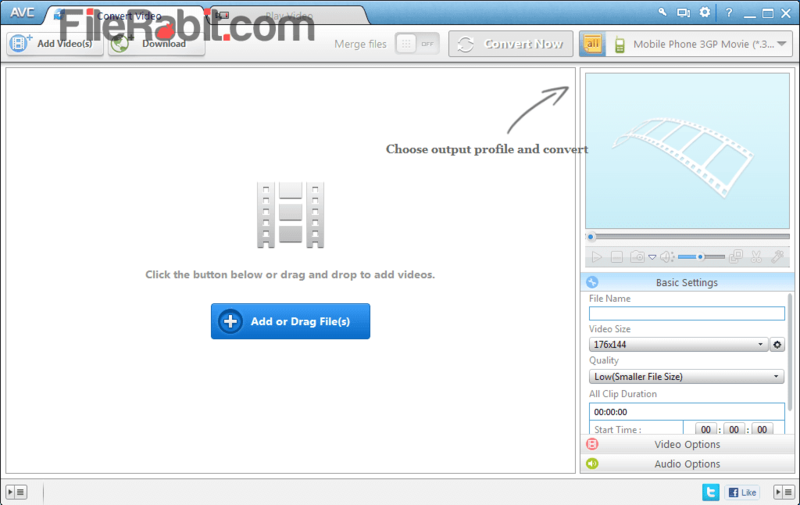 Moreover, it has internal codec support such as XviD, DivX, MPEG-4 and x264. The video resolution will be automatically selected when user select target profile group.